This picture was from last year. Everyone was home and we were able to celebrate as a family. Stephen’s work schedule (and now that he has moved out) it is harder to see him. When we spoke about it last night, he wasn’t sure that he would be able to come by to celebrate Christmas until New Year’s Day. It’s hard for those who work in the holidays to be able to spend time with family and friends. I don’t normally think about those that are working when I shop or eat out until I have someone close to me that is going through it. Holidays are not always a happy time for most. It is stressful and typically has disappointments from unmet expectations. When the kids were small, they shared the holiday with my ex husband. I really didn’t want to even have a tree up if they weren’t home but I knew that when they did get home they would want it. Being separated from loved ones over a holiday is so very difficult. All of this to say, hug your loved ones. Enjoy the moments you are able to have with one another, and remember the greatest gift. Happy May 1st! Having bratwurst tonight. One of my first memories of being in Germany is a carnival. Not sure where exactly I was, but was with my sister, and we were sitting on a bench watching kids dancing with spring wreaths on their heads. Maifest (Mayfest) is one of mankind’s oldest traditions! It is the celebration of nature’s bright reawakening after winter’s cold darkness. The ancient pagan festival eventually took on Christian religious significance, much like Christmas. However, it is now a colorful, joyous part of history and culture in Europe! The custom of the maypole began in the tenth century, when villagers would erect a pole in the local square. They would decorate it with sausages, cakes and multicolored ribbons! The villagers would dance around the maypole, as medieval citizens believed that it would bring good luck and wealth! I will be taking my math final tonight, so not a lot of celebrating today. But I may have a bratwurst, and a bite of chocolate? Every weekend in the Spring and Summer (so it seemed) my parents would grill out. We would have steaks, chicken and pork ribs. Mom would marinate them in the same basic recipe, and make the BBQ sauce. Growing up, friends would benefit from this grilling as well. It was always good, and it seemed we always had plenty to share. 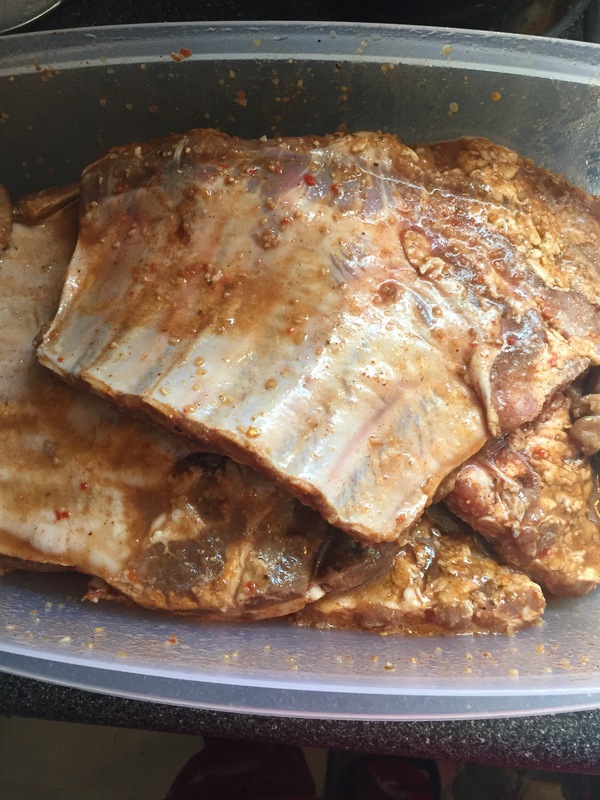 I have been craving ribs for a while, and with my WLS it has been even stronger of a craving. Tender, moist ribs would be the key to me being able to eat, enjoy, and process the meal. Grilling over charcoal was one key, and low and slow the other. Once the meat is cooked almost through, apply the BBQ sauce. If your sauce has a lot of sugar in it, it will burn easily. 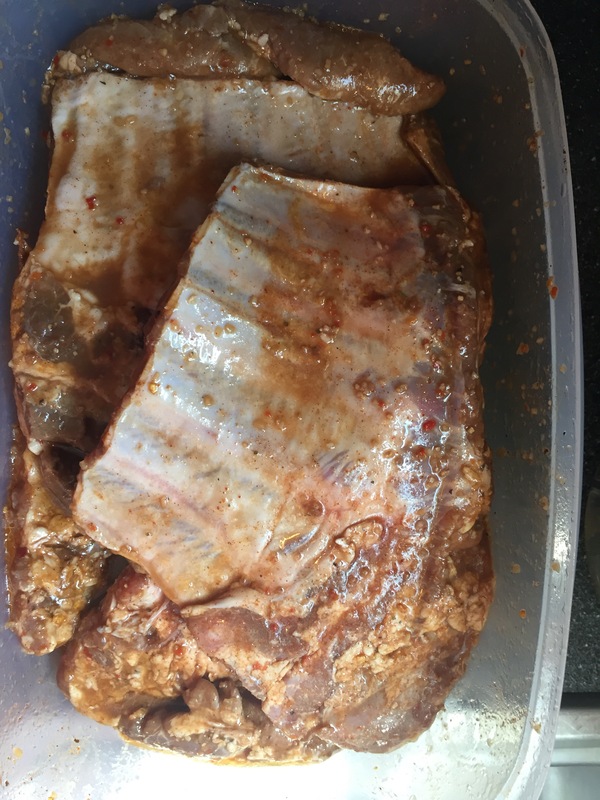 So pay attention to your ribs turning and applying more sauce after each turn. Remove from the grill, and cover with foil to rest about ten minutes or so. Then slice in between the bones. These were moist, tender, and fully cooked with tons of flavor. 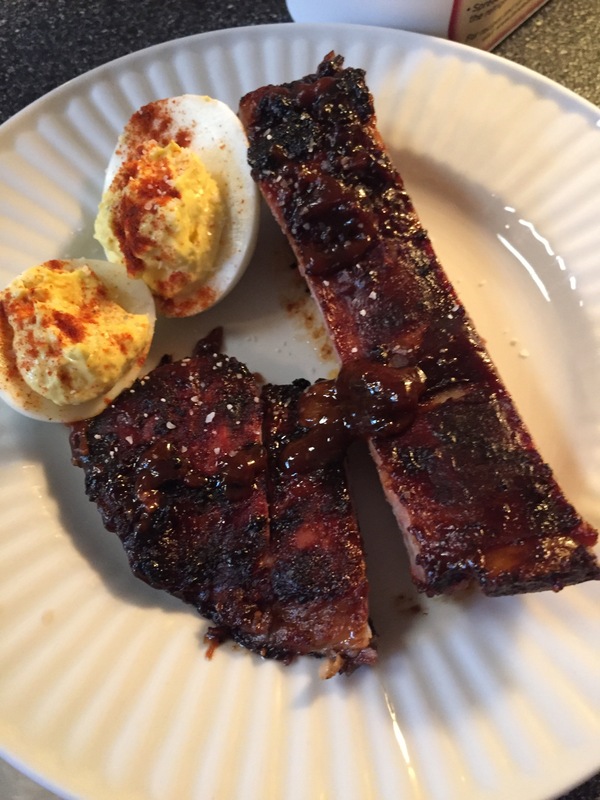 I got to enjoy one rib, and a nibble (extra bit of meat without the bone), and two deviled eggs. This satisfied my cravings for ribs, and just relaxing outside. I can also confirm that these will be enjoyed throughout this next week. When did you stop believing in Santa? Did some other kid tell you, and then you paid attention at Christmas? Or did you question all the time? If you don’t believe in Santa, he stops coming. Hmmm…she is about to be 20 years old, and says she still believes. Ha! Do you do any type of traditions like the Elf on the Shelf? I think that is a cute idea. Great marketing for the company. We have a simple cloth advent calendar. The kids fight over who does what day. It has hung in my house since Carmen was born. My mother had one at her house (just in case the kids were there), that is now in storage. It will go with one of the kids (whoever has children first), and then mine will go with the other. Passing it along. And, so the Christmas season has begun at our house. Still trying to get photos to upload correctly. Yes, I am still frustrated.